Glad you like the Almqvist Brothers’ little combo! I had no doubt you were hip to begin with. I tried to like Scissor Sisters. It just didn’t work for me! Great post, though. I have a feeling that a little Scissor Sisters goes a long way … still it would be fun to be able to see them in the flesh. Thanks for reading! 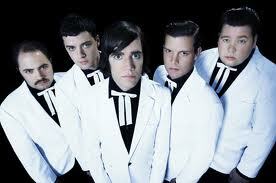 We’re also going to see the Hives on this tour–let me know what you think after the show. I want to thank you for letting me know a new Hives record was coming out. I had no idea!